Male circumcision reduces men’s risk of human immunodeficiency virus acquisition; however, few countries in sub-Saharan Africa have achieved targeted rates of voluntary medical male circumcision. To assess the effect of small economic incentives on circumcision uptake, Thirumurthy and colleagues randomly assigned 1502 Kenyan men to receive varying amounts of compensation (in the form of food vouchers) conditional on undergoing medical circumcision. The authors report that compensation worth approximately US $8.75 or US $15 compared with lesser or no compensation resulted in a modest increase in voluntary circumcision rates. Routine use of pulse oximetry may be associated with a lower threshold for hospitalization of infants with bronchiolitis. 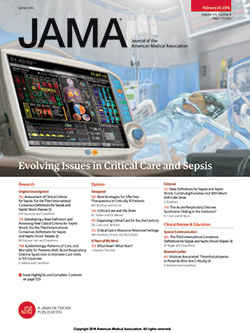 In a randomized trial that enrolled 213 infants with mild to moderate bronchiolitis and true oxygen saturations of 88% or higher, Schuh and colleagues found that infants whose displayed oximetry measurements were artificially elevated 3 percentage points higher than the true value were less likely to be hospitalized or to receive active hospital care for more than 6 hours than were infants with unaltered oximetry readings. In an Editorial, Vinci and Bauchner discuss deception in research and optimal assessment and management of children with bronchiolitis. Hospitalization provides an opportunity for smokers to quit, but maintaining cessation after discharge can be difficult. In a randomized trial of 397 hospitalized daily smokers who wanted to quit smoking, Rigotti and colleagues found that a postdischarge intervention—involving 5 automated interactive voice-response telephone calls providing smoking cessation advice and support and free smoking cessation medication for 90 days—resulted in higher rates of smoking cessation at 6 months than did standard care, which involves a recommendation to use smoking cessation counseling and medication after discharge. Infants with severe combined immunodeficiency (SCID)—characterized by defective production of T and often B lymphocytes—are susceptible to life-threatening infections; therefore, early detection and treatment can be life-saving. In an analysis of data from more than 3 million newborns in 10 of 18 states and the Navajo Area Indian Health Service, which conducts population-wide SCID screening, Kwan and colleagues found that screening identified SCID in 1 in 58 000 infants. In an Editorial, Holtzman discusses implications of newborn screening for the diagnosis, prognosis, and optimal management of SCID. A recent article in JAMA Pediatrics reported that concussion rates in elite middle school–aged female soccer players exceed those reported in older age groups and that most of those with concussion reported playing with symptoms. In this From the JAMA Network article, LaBella discusses symptoms and potential adverse or long-term effects of concussion. A 39-year-old woman experienced acute-onset headache and right-sided hemiparesis. Brain computed tomography showed a frontoparietal ring-enhanced lesion. Red papules on the tongue, trunk, and limbs were noted on physical examination, and a history of epistaxis since childhood was reported. Blood cultures were obtained and antibiotics begun empirically. What would you do next? This JAMA Diagnostic Test Interpretation article by VanWagner and Green presents the case of a patient with inflammatory arthritis and elevated serum ferritin, transferrin saturation, and aminotransferase levels. He is overweight and reports drinking 2 alcoholic beverages daily. How would you interpret the diagnostic test findings?